Roses Only is a luxury London based rose florist, but these roses arent like normal roses, they are big, beautiful and luscious and at £70 for 12 roses thats exactly what you would expect! They offer same day delivery on all London orders placed before 6pm and come delivered in a long brown box wrapped up with a bow (we'll just forget about the rude delivery guy who complained that he had to come all the way from Baker Street when we have a florist down the road.) They arrived on a Saturday so luckily I was at home with Andrew - we took the huge box out into the garden so I could have a proper look at them. The roses come laid on a bed of tissue paper which made it all the more luxury - they just look so impressive even laying in the box. They even come with their own little water supply packs so that they dont dry out on the journey and they are literally the bigget roses I have ever seen. Here, I have the bright mix which is a selection of beautiful peach and pink roses. On a seperate note - how cute are my new Vans*?! I loved the whole hawaii collection when it came out earlier this year but slip ons have always been my call and I love that they arent identical. I got mine from Foot Locker and they just so happen to be in the sale at the moment for £20 if your interested! 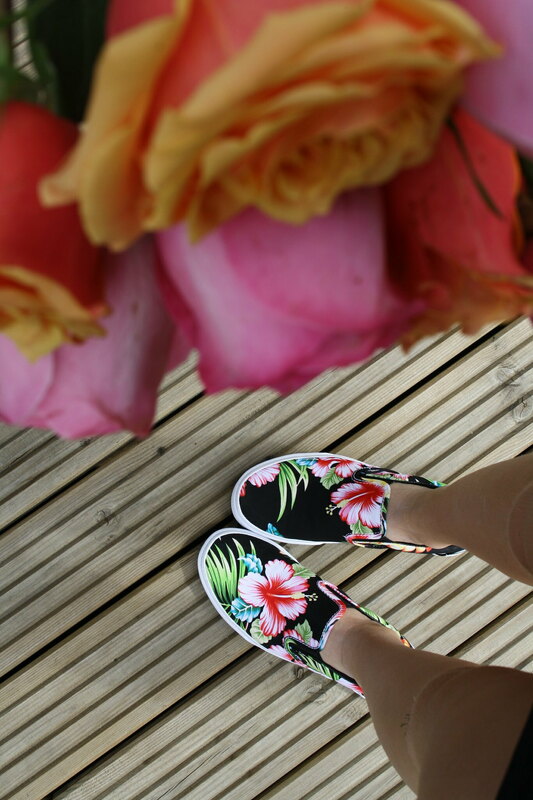 Love your shoes, and cute roses too!